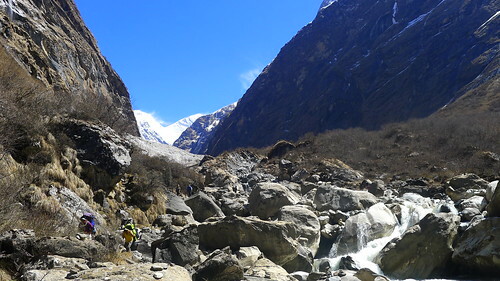 The Kick Galvanic: Annapurna Base Camp Trek - Day 6: Reaching the Annapurna Sanctuary finally! Annapurna Base Camp Trek - Day 6: Reaching the Annapurna Sanctuary finally! D-Day. Always the hardest day. And certainly an unforgettable one. I woke up shivering in the cold inside my room at Himalaya, rather dreading what was about to happen. I knew the final push would always be difficult; it was either I make it to Annapurna Base Camp today or not. Even if I had made it to Everest Base Camp last year at the [literally] breath-taking altitude level of 5,360 meters above sea level, I was never complacent enough to think that reaching ABC was a done deal. Being the realist that I was, I knew a dozen things could go wrong: a terrible bout of altitude sickness perhaps, or an ankle sprain -- or even an avalanche. 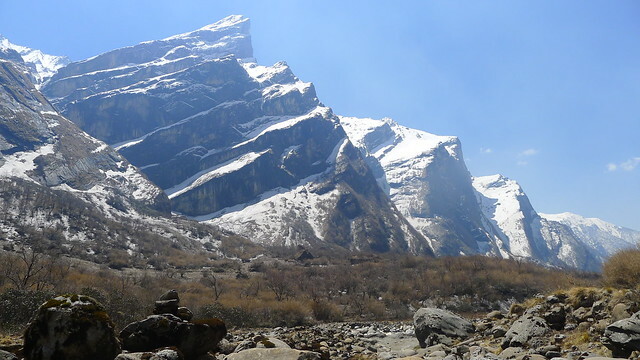 Annapurna Base Camp (4,130 m) is a sanctuary located within an imposing ring of mountains and no stranger to avalanches, which occur at times within the year. This area did pose a certain risk -- one that I was reluctant to tell my family and friends back home. It was bad enough that I got a million messages while in Tadapani on Day 3 when they had heard about the avalanche in Everest Base Camp. I think if I had mentioned that Annapurna was prone to avalanches too, my loved ones would have probably gone into collective cardiac arrest. That said, the locals would know best which routes to take after an avalanche or even whether to proceed OR NOT to base camp depending on the amount of snow falling. The local guides will be able to determine if it is safe to stay put and delay the trek to ABC if they feel an avalanche is highly possible. This is their territory, after all, and it would be wise to heed local advice. Us small people vs large boulders. This area is prone to landslides and avalanches. I was anxious to start as early as possible, and so we left at 7:30 am. It was very cold, but I wore only 2 layers of thermals, my down vest, a scarf and a wool cap. I refrained from completely bundling up since Madan mentioned that the trail going up would be tough. If I was going to work up a sweat on the ascents, I didn't want to feel super hot and stuffy inside my outer shell jacket. The trek from Himalaya to Deurali usually takes 2 hours but we did it in 2.5 hours due to the regular route being blocked from a recent landslide. And so we had to go through the more difficult path by the river bed and scramble over some large rocks. I was suddenly feeling very, very exhausted. And when both the fatigue and headache started manifesting, I knew that I was starting to contract that all too familiar feeling of acute mountain sickness. After all, I was already past the 3,000-meter altitude mark. Hello, AMS, you old friend you. 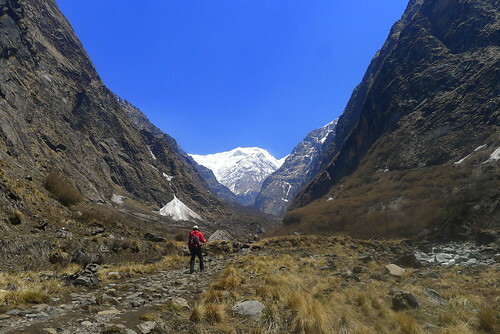 The way from Deurali onwards looked very dramatic; you can feel you're officially entering the Annapurna Sanctuary as you trek through this narrow, rocky pass heading into the ring of mountains. This was avalanche territory, but the quasi-terror and fatigue I was experiencing still could not suppress the general awe I had of this beautiful place. By the time we reached snow-filled Machhapuchhre Base Camp (3,700 m) for lunch, the sky was overcast and I was totally beat and actually starving. My brain was having a hard time processing that I still needed to make it to Annapurna Base Camp before nightfall. Inside the MBC teahouse, a lot of trekkers crowded inside the dining hall. Majority had no intentions of going to ABC that day. Their aim was to spend the night at MBC and then trek up to ABC early morning the next day. Which was a solid plan, actually, and one that I was ready to embrace -- especially when it started to rain hard as I was wearily eating my vegetable rice. Madan kept looking out the window, his frown deepening as the rain continued. A small part of me wanted him to decide that we would be sleeping in MBC tonight, but the stubborn (and hence, bigger) part of me felt that I had to stick to plan and reach Annapurna Base Camp that same day. I had psyched myself to do it in 6 days, and I didn't want to disappoint myself. The vegetable fried rice did wonders to my energy level and I was suddenly itching to leave. When the rain finally stopped after an hour or so of waiting, Madan gave me the signal to go, and there we were, negotiating the slippery, slushy snow up to Annapurna. Hari plunged way ahead and soon, he was just a small speck in the distance. Madan stayed with me, of course, and ensured that I wouldn't be falling into deep holes of soft snow. By now, I had to bundle up and put on my outer shell jacket which protected me from rain, snow and the biting cold. I was getting a bit nervous because I was surrounded by mountains on all sides - these snow-covered silent, imposing mountains that were so majestic and terrifying at the same time. They looked like they were watching me, judging me, waiting for me to mess things up. Please, please, no avalanches please, I half-prayed, half-chanted silently. And then it began to snow in earnest: first from behind, and then snow started coming in all directions, pricking my face like tiny, cold needles. To make things worse, I had just realized something that immediately filled me with panic. If I were in a movie, this would have been a dolly zoom moment, with the camera zeroing in on the stricken expression on my face. My gloves. I left my gloves inside my rucksack. Which Hari was carrying right now. OH. MY. GOD. I. AM. NOT. WEARING. ANY. GLOVES. AT. ALL. Those two hours felt like an eternity. It was to be one of the most profound and challenging experiences in my life so far. I kept trudging up, doing my best not to slip in the snow. With my face half-covered by my wool scarf and my jacket hood protecting my head, I looked like a total Eskimo. I also tried not to look at my hands, because to see them would be to fully accept how totally cold and unprotected they were. Shoving my hands into my pockets wasn't that much of an option because I needed to hold onto my trekking poles badly for stability. I was still going up, up, up on very slippery snow. During the first hour, I was able to encounter people who were on their way back. They were in a hurry, as the weather wasn't being cooperative. But as the snowfall worsened, it became clear that it was just me and Madan on the trail; no more trekkers venturing out into the snow that day. As you can very well see, I had no gloves. Argh. Earlier, I had prayed for no avalanches. This time, I was praying not to get severe frostbite. Surely, I wasn't going to get frostbite at 3,700+ meters within 2 hours of trekking, right? Right? I repeatedly told myself how stupid I was. My kingdom for a pair of gloves right now! My head was throbbing, the snow kept falling, and the landscape was a complete white-out. I could barely even see Madan, who was ahead of me, setting out a path for both of us. At some point, I got emotional and started to tear up. I thought, was that a symptom of altitude sickness, too? Madan didn't get to see the tears forming at the corners of my eyes, but the silent mountains of the Annapurna range did. They were the only witnesses to my near-breakdown. The secret to enduring such conditions, I believe, is not to think too much. I tried not to think of my near-frozen hands and my numb face. I just focused on going up, one step at a time. Sure, I had a headache from the mild AMS and I felt like I was living in an icy hell at that point, but there was something I was still immensely grateful for: that there was ample -- little, but still ample -- oxygen in the atmosphere. I never felt completely robbed of breath. 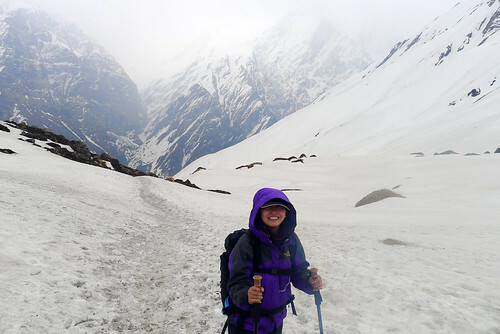 In the Everest region, I felt I was fighting for air most times; here in Annapurna, all I had to worry about was the rough trail and the snow. Oh, and the lack of gloves, of course. I promised myself that if I ever made it out of ABC alive, I would buy four extra pairs of gloves and just stuff my pockets silly with gloves on my next trek. After a while, I couldn't believe it when Madan suddenly stopped in his tracks, turned to look at me with a grin and said, "Can you see the ABC teahouses? We'll be there in 10 minutes." Really? We're here? 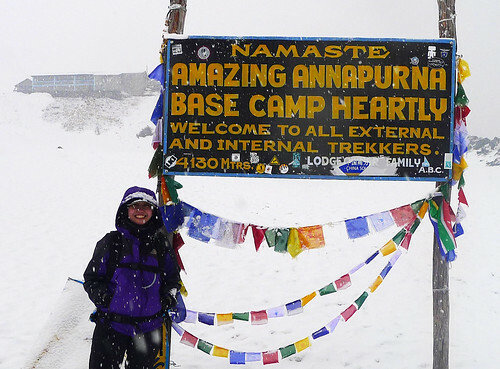 I strained my eyes but because of the heavy snow falling, all I could make out was the famous Annapurna Base Camp marker, which welcomes every trekker. And then I saw a patch of blue and brown, making its way towards us. It was Hari. He was coming for us, braving the cold wind and snow once more. When he reached us, I immediately held out my hands. "Look, Hari! I forgot my gloves!" And my porter smiled the widest smile I've ever seen. "Oh! Good! You trekked in the snow without gloves. Just like a Nepali!" I think he was very proud of me...! Madan suggested that we take photos beside the ABC marker early next morning but I insisted that we have a few photos taken now. It was important that I capture that moment of arrival--snow and all. 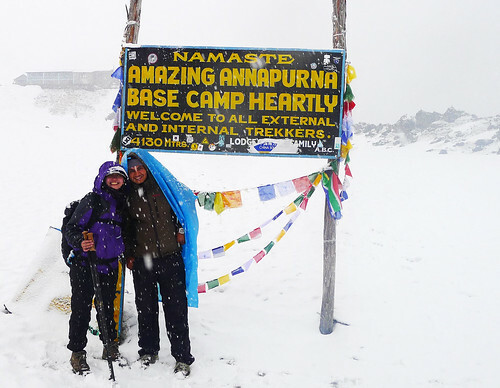 And I could finally say to myself that I made it to Annapurna Base Camp in 6 days, as planned! At the Annapurna Base Camp marker with my porter Hari. Not even the heavy snowfall could dampen my joy. And yes, I made it to ABC without gloves! I didn't realize how terribly cold it was until I was inside my room at the teahouse. Shivering uncontrollably, I peeled off all my gear made wet by the snow. 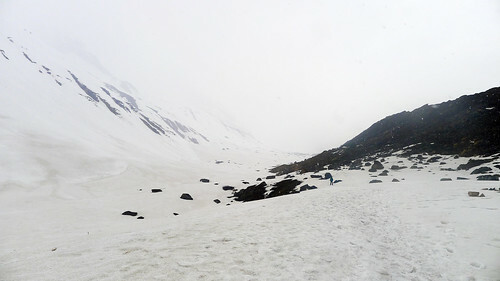 Most rooms were empty because the snowfall probably deterred more trekkers from arriving that day. While the teahouse owners were preparing dinner, I felt the urgent need to call home. I knew my family was worried about me. There wasn't any mobile signal in ABC, so I had to use the teahouse's satellite phone service at Rs 200 (US$ 2) per minute. What was supposed to be a 1-minute call to my younger sister ended up being a 7-minute one because I learned that moment that my beloved 2-year old Syrian pet hamster Ginny passed away yesterday. Needless to say, I was very upset and I cried. I knew Ginny was in the twilight of her years as a hamster, but I had hoped that she would still have a few extra months to go. What devastated me was that I wasn't there when she passed away, but my mom reassured me that she died peacefully, inside her comfy hideout, without any sickness. It was just old age. I was heartsick over her passing, but glad too that she lived a very happy and contented life. It was sweet how the teahouse people fussed over me and my dinner when they found out why I was so upset. Tried to eat my pizza dinner, but I could only manage a few bites. I didn't even finish a slice! My headache was worsening as well. By 7:30 pm, I whispered to Madan and Hari that I was completely exhausted and ready to sleep. Woke up in the middle of the night to pee. My bladder felt like it was about to burst; this feeling is all due to Diamox. I bundled up, put on my head lamp, and braved the cold to go to the common toilet outdoors and peed like a gallonful. The headache was still there and I wished that it would go away by daybreak. Like an answered prayer, all traces of altitude sickness were gone when I woke up at 3:20 am. In the darkness, I mouthed a silent 'thank you.' A thank-you to God, yes, but really, it was also just a thank-you in general. A thank-you to the mountains, a thank-you to the wonderful people who helped me along the way. I had made it to Annapurna Base Camp at 4,130 meters above sea level, and I had every reason to be thankful. 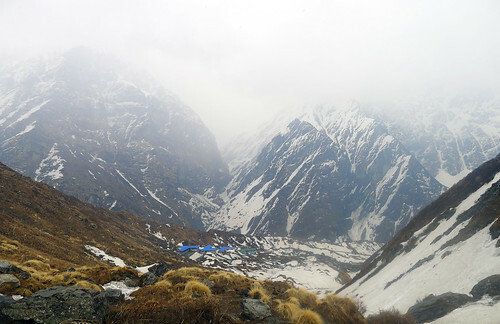 My next post will focus on seeing the beautiful Annapurna Sanctuary at the break of dawn. The 360-degree view is incredible. More on that soon!